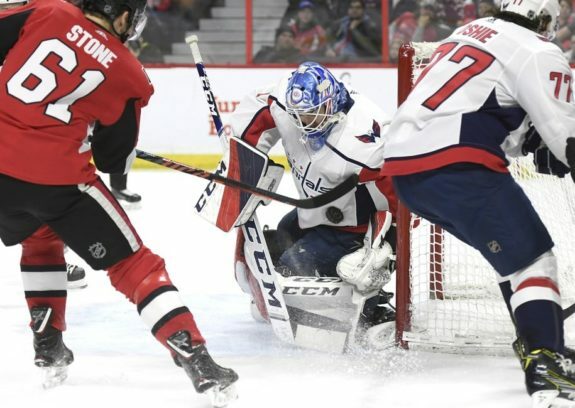 OTTAWA — Pheonix Copley made 35 saves for his first career shutout as the Washington Capitals beat the Ottawa Senators 4-0 on Saturday. Brett Connolly, Matt Niskanen, Jakub Vrana and Michal Kempny scored for the Capitals (22-10-3). Washington is now 7-1-0 in its past eight games and has scored at least four goals in 10 of its past 13. Mike McKenna stopped 29 shots in place of the injured Craig Anderson. With Anderson dealing with an upper-body injury Marcus Hogberg was recalled from the American Hockey League’s Belleville Senators. Copley is the first rookie goaltender to blank the Senators since James Reimer in 2011. Washington took a 3-0 lead midway through the second as Vrana stole the puck from Mark Stone and beat McKenna with a great move. Kempny made it 4-0 at the 13-minute mark when his point shot deflected off Cody Ceci. Connolly opened the scoring at 1:32 as he re-directed Jonas Siegenthaler’s point shot. McKenna then went on to make an impressive glove saves on Andre Burakovsky and Travis Boyd. Bobby Ryan also stopped a sure goal when McKenna was caught out of position. The Capitals took a two-goal lead late in the period as Niskanen got behind Ceci and tipped Nicklas Backstrom’s pass for his fifth of the season. Notes: The Senators honoured LPGA golfer and Smiths Falls, Ont., native Brooke Henderson prior to the game and had her drop the puck. Ottawa’s Tom Pyatt and Max Lajoie were healthy scratches. Washington’s Tyler Lewington made his NHL debut Saturday night.